If believing in an invisible friend makes people happy, then normally I would see no reason to interfere. But when an invisible friend appears to contradict squish theory, I feel it does require further investigation, and such a case involves dark matter. The primary justification cited by dark-matter-believers, is that stars in the outer reaches of galaxies are moving too fast to be held in orbit by the amount of ordinary matter in the galaxy. This might lead you to assume that astronomers have accurately measured all the ordinary matter in these galaxies, then done their level best to explain orbits on this basis, before finding themselves reluctantly forced to contemplate the possibility of a new form of matter. So it seems that one group of physicists are estimating the number of stars in galaxies based on their belief that dark matter exists, whilst other groups are using this estimate of the number of stars as a reason for believing in dark matter. Physicists confidently declare ”the universe contains 4.9% ordinary matter, 26.8% dark matter and 68.3% dark energy”. Yet estimates for the mass of the milky way, that tiny speck of the universe in which our solar system resides, range from 500 billion to 3 trillion solar masses. It would seem to be a very odd universe, where physicists can state categorically its age, what it was like a fraction of a second after the big bang, and the exact proportion of undiscovered dark matter, but have only a vague knowledge of the mass of our galaxy. Of course not all physicists are devout dark-matter-believers. National Geographic have an article about a research team who reported failing to find dark matter in the solar neighbourhood. Their report was met with scorn by a mainstream dark-matter-believer, who with breathtaking irony declared “Extraordinary claims require extraordinary evidence”. The point of this page is not to prove that dark matter does not exist, nor even to show that the motions of galaxies can be explained on the basis of known quantities of ordinary matter. Neither of theses things can be done, because there is not enough accurate data available with which to calculate. Instead what I am going to do, is discuss the gravitational mechanics of a disc, and suggest the sort of distribution of matter that could result in the observed rotation curve of the milky way. The milky way resembles the solar system in the sense that they are both flat discs. This seems to have led astronomers to conclude that they should have similar rotation curves, unless dark matter is added. In fact this would only be the case in rare circumstances, such as if almost all the mass of the milky way was located in the central bulge, or if the disc of the milky way was of uniform thickness and density and extended to infinity. The gravitational mechanics of a disc are complex, and depend on the ratio between the diameter and the thickness, and also on the density distribution. The gravitational mechanics of a sphere are more straightforward, and were figured out by Newton over 300 years ago. This may partly explain why astronomers appear to have opted to try to explain the rotation of galaxies in terms of spherical distributions of mass, as it is very much the easy option. Newton showed that if you are outside a sphere composed of shells of uniformly distributed mass, then the gravitational pull of the sphere is the same as if all its mass were in the centre. He also showed that if you are inside a spherical shell of uniform density, then you feel no force from the shell. This means that if you are embedded in a sphere composed of uniform shells; then the force you feel is simply all the mass nearer than yourself to the centre, divided by the distance to the centre squared. That makes the maths of explaining the rotation curves of galaxies easy for dark-matter-believers. Since the rotation curves are flat at large distances from galactic centres, all they need to do is proclaim that dark matter is arranged spherically around the centre of galaxies, and that the dark matter density falls off with the square of the distance from the centre: eg. at 3 times the radius, the density is 1/9. And of course nobody can gainsay them, because dark matter is decreed to be invisible and undetectable. All the ordinary matter arranged spherically in what is known as the galactic halo, will also affect the orbits of stars in the disc; but astronomers claim such matter is sparse, and since I have no particular reason to disbelieve them, I will ignore the halo and only consider the composition of the disc. In the above diagram the yellow dot is a star. All the circular rings comprising the green area, exert a force towards the centre; whilst all the rings in the red area are pulling the star away from the centre. The net force depends on the density of the rings; and in theory if it were possible for the red rings to be denser than the green ones, then the net force on the star could be away from the centre. The black dot represents the centre of the disc, and the yellow dot a star. The red and green areas cancel out, so there will always be a net force exerted by the blue area pulling the star towards the centre. 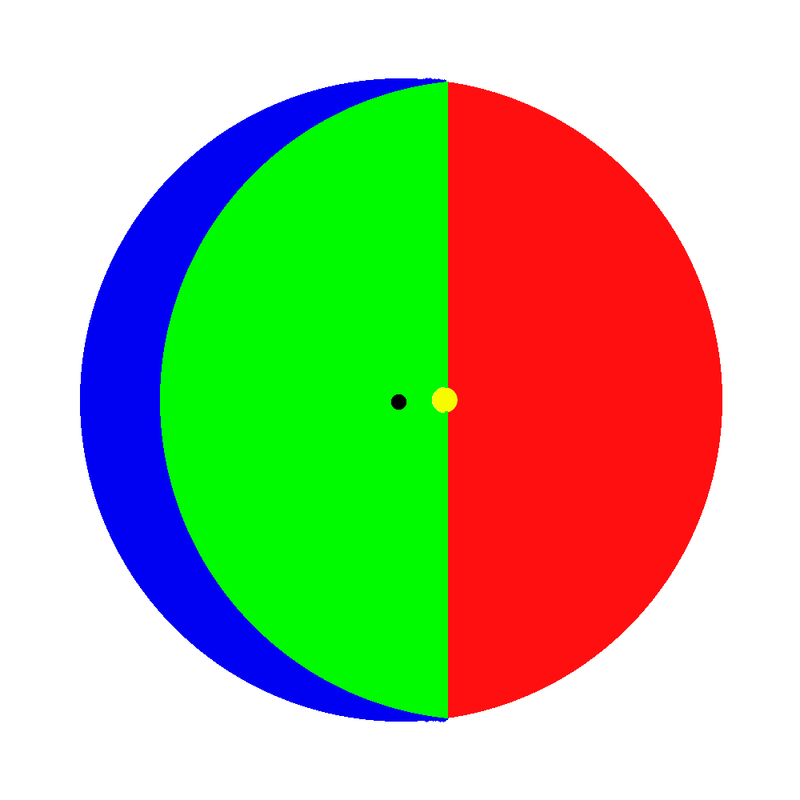 If the star is only a small distance from the centre relative to the size of the disc, then the force will be small due to the distance to the blue area and the fact that gravitational forces fall off as 1/r². For a star on the edge of a disc that ends abruptly, the force towards the centre depends on the thickness of the disc. The milky way is usually described as being 100 thousand light years in diameter, and 1 thousand light years thick, a ratio of 1:100. The gravitational force on a star at the edge of such a disc of uniform density, would be about 4.5 times as great as it would be if all the mass of the disc were located at the centre. I obtained the figure of 4.5, by dividing the disc into 50 rings, each with a square profile, that is with the same width as thickness. I then assumed all the mass of each ring to be located in an infinitely thin ring passing through the centre of the square profile. I then obtained a value for the definite integral of each ring, and added them all up. I employed a similarly complex method to obtain the other results quoted here. Below are some examples of rotation curves for the milky way, which I have copied from other websites. In each case the ‘observed curves’ look broadly similar, though there is sufficient variation to suggest that the velocities of stars is not firmly established. However the main disagreement lie in the predictions of how the curve should appear in the absence of dark matter. It seems that the creators of the various graphs were all fully convinced by the need to believe in dark matter, but totally at odds when it came to the calculations. The ‘hypothetical curve’ above, indicates that dark matter is needed to explain the orbits of all the stars outside the central bulge. In the case of the sun, at a radius of 30 thousand light years, the ‘hypothetical’ centripetal force exerted by ordinary matter in the galaxy, must have been assumed to be little more than a half that required to match observation. For a star at a radius of 30 thousand light years, the assumed value is about 2/5. This second rotation curve comes from Wikipedia. Its compiler apparently thinks that the sun‘s orbit can be accounted for by ordinary matter, but that dark matter is required to explain orbits beyond 30 thousand light years. Therefore the compiler apparently thinks that ordinary matter exerts nearly twice as much force on the sun as the compiler of the first curve believed. 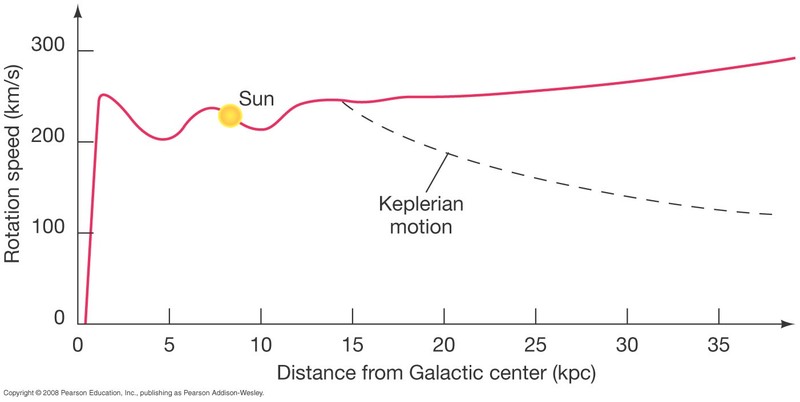 The third graph indicates that dark matter is only needed beyond a radius of 50 thousand light years. Therefore the compiler apparently thinks that ordinary matter exerts 2 ½ times as much force on a star at a radius of 50 thousand light years, as the compiler of the first curve believed. There are several explanations for the discrepancies between the 3 graphs. Firstly they might have relied on very different data for the density of various parts of the galaxy. Secondly they might have used similar data, but have done their calculations differently. Thirdly they might have assumed that everybody is so committed to believing in dark matter, that any kind of scientific accuracy is completely unnecessary. Unfortunately I have been unable to find a measured mass for the milky way’s central bulge, nor data for the density of the galactic disc. So all I can really do is suggest a distribution of mass within the disc and central bulge, which could roughly account for the observed rotation curve. The simplest model of the milky way would look like this; A disc of uniform thickness and density, with a spherical central bulge. The problem is that such galaxy could never have the observed rotation curve. However a satisfactory result can be obtained by assuming that the density of each part of the disc, is inversely proportional to its distance from the galactic centre; meaning that when I divide the galaxy into rings, each of the rings have an equal mass. If the milky way ended abruptly, then the outermost stars would need to be orbiting much faster than their near neighbours; so for this reason I have also assumed that all the rings way beyond the recognised edge of the milky way, also have the same mass. One way to calculate the mass of all the rings, is to use the density of the area around the solar system. Based largely on counting stars, this is usually estimated to be a bit over .003 solar masses per cubic light year. In order to get a satisfactory result I have had to assume a density in the solar neighbourhood of about 4 times that value, giving each ring a mass equal to 2.5 billion suns. This discrepancy does imply some missing mass. So instead of filling the halo full of dark matter, dark-matter-believers could instead assume that there is 3 times as much dark matter as ordinary matter in the disc. Indeed it might be considered more logical to assume that dark matter would gravitate towards the disc in the same way that normal matter does, as dark matter is supposed to interact gravitationally. There are however some possible reasons why the measured density in the solar neighbourhood, might be on the low side. Firstly there may be more stars still to discover, indeed the third nearest star system to the sun was only discovered in 2013. It is however a pair of brown dwarfs, with a combined mass of only 0.04 solar masses; so there would need to be plenty of them around to make up all the missing mass. Another possibility is that there is more debris in interstellar space than currently acknowledged. The planets and other stuff out to Pluto, have a total mass estimated to be about 0.0014 solar masses; however Pluto is only around 1/6000 of the distance from the sun to the nearest stars, so there is plenty of space in which stuff could be floating around. Also the sun appears to not be in the brightest part of the milky way spiral. Therefore its neighbourhood is likely to be less dense than some other areas, as the brightest stars tend to be the most massive. The sun is approximately 30 thousand light years from the galactic centre. So cutting the milky way into rings 1 thousand light years wide, there are 30 of them nearer the centre than the sun, all pulling the sun towards the centre. Assuming each ring to have a mass of 2.5 billion suns, and subtracting the force away exerted by all the rings outside the sun’s orbit, I ended up with a net gravitational force towards the centre equivalent to a mass of 83 billion solar masses at the galactic centre. For the sun to be in a circular orbit around the galactic centre at its measured speed, would require a force equivalent 100 solar masses at the galactic centre. Hence I have to assume a mass of 17 billion suns for the central bulge. 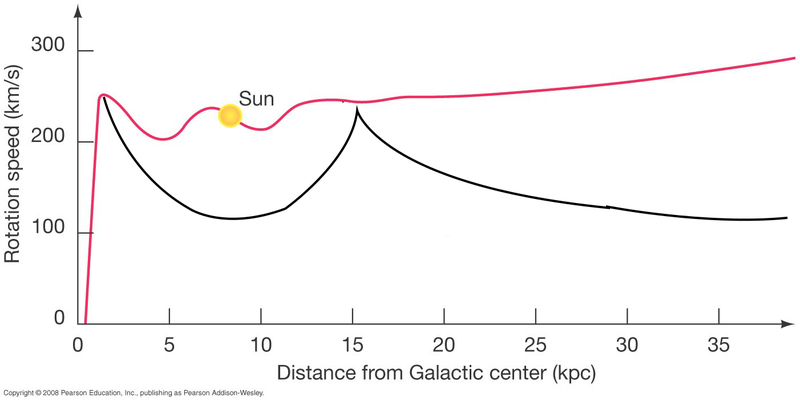 The central bulge has a radius of about 6 thousand light years, or 1/5 that of the suns orbit; therefore for a star on the edge of the central bulge to orbit at the same speed as the sun, as appears to happen, the force towards the centre would be equivalent to 20 billion suns at the galactic centre. Once we take into account the outward pull of the rings outside the central bulge, the total mass of the central bulge should be about 25 billion suns. If we add the 17 billion suns of the bulge to the 15 billion suns made up of the 6 rings, we get 33 billion solar masses, so the figures are a bit off, but not grossly so. A star on the recognised edge of the milky way, at a radius of 50 thousand light years, orbiting at the same speed as the sun, would require a force equivalent to 160 billion suns at the galactic centre. When I added up the force of the 50 rings nearer the galactic centre, and then subtracted the force of all the rings further from the galactic centre to infinity, and adjusted for the mass of the central bulge, I ended up with a force equivalent to 157 suns at the galactic centre. My calculation for a star at a radius of 50 thousand light years; shows that the centripetal force exerted by the disc, is equivalent to the mass inside the radius of the star, plus about 1/8, all acting at the galactic centre. Since I assumed that all the rings have an identical mass, out to infinity, a similar situation will occur at much greater radii. 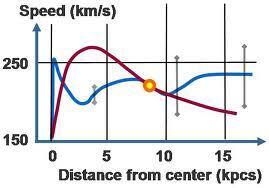 This means that the centripetal force will vary by approximately 1/r; and since centrifugal inertia is given by v²/r, for these to balance in a stable circular orbit, v must remain constant, giving the observed flat rotation curve of the milky way to very large radii. The problem with assuming that the rings all have the same mass out to infinity, is that it is not very realistic. But the problem with trying to find a more realistic model mass distribution, is that there is no reliable data available. Which is absolutely nothing like any observed curves or any ‘hypothetical curves’ created by anybody else. Physics-believers tend to claim that dark matter is proved by the maths, but I have yet to find any evidence that any of the professional dark-matter-believers have actually bothered with the gravitational maths of a disc. An opinion apparently shared by the authors of this paper who have applied similar mathematical techniques as myself. 2 Responses to Dark Matter. Invisible friend, or enemy of reason? After further thought, I do now think that dark matter does exist in a form that does not contradict squish theory. However that does not negate the arguments and calculations on this page.